Eukaryotic cells have evolved a family of ATP-dependent proton pumps known as the vacuolar (H+)-ATPases (or V-ATPases) to regulate the pH of intracellular compartments, the extracellular space, and the cytoplasm. 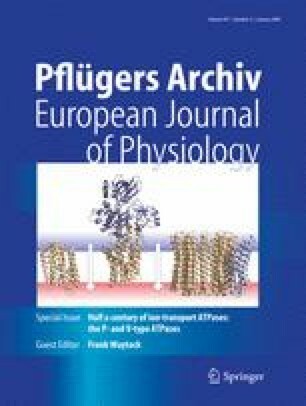 V-ATPases present within intracellular compartments are important for such normal cellular processes as receptor-mediated endocytosis and intracellular membrane traffic, protein processing and degradation and coupled transport of small molecules and ions. They also facilitate the entry of a number of envelope viruses and bacterial toxins, including influenza virus and anthrax toxin. V-ATPases present in the plasma membranes of cells are also important in normal physiology. They facilitate bone resorption by osteoclasts, acid secretion by intercalated cells of the kidney, pH homeostasis in macrophages and neutrophils, angiogenesis by endothelial cells, and sperm maturation and storage in the male reproductive tract. In the insect midgut, they establish a membrane potential used to drive K+ secretion. Plasma membrane V-ATPases are especially important in human disease, with genetic defects in V-ATPases expressed in osteoclasts and intercalated cells leading to the diseases osteopetrosis and renal tubule acidosis, respectively. Plasma membrane V-ATPases have also been implicated in tumor cell invasion. V-ATPases are thus emerging as potential targets in the treatment of diseases such as osteoporosis and cancer. Ayana Hinton and Sarah Bond contributed equally to this work. This work was supported by NIH Grant GM34478 (to M.F.). A.H. and S.B. were supported by NIH Training Grant DK 07542. The authors thank Daniel Cipriano, Kevin Jefferies, Jie Qi and Yanru Wang for helpful discussions.